Nail abnormalities are problems with the color, shape, texture, or thickness of the fingernails or toenails. Like the skin, the nails tell a lot about one’s general health. Spoon shaped nails are a clue to iron deficiency anaemia and depressions across the nail can be a sign of illness or malnutrition. 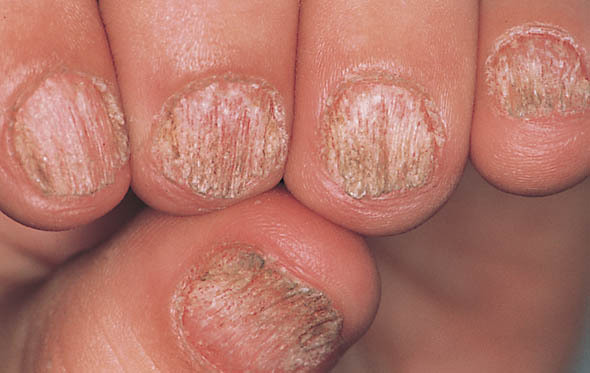 There are many causes of abnormal appearing nails: from fungal infections which can cause thick, crumbly nails to small pits or lifting of the nail plate in psoriasis to ridging in lichen planus or a green discolouration from pseudomonas infections. Nail dystrophies fall under the care of dermatologists and we will conduct an examination of the whole body to look for clues to help us make the diagnosis. A scraping or clipping of the nail may be taken to send away for microscopic examination and culture to exclude fungal infections of the nails in particular. Once we have ascertained the cause of the dystrophic nails, we will discuss potential treatment options with you so that you can again shake peoples’ hands with confidence!